LWT is an education company that provides one of the most widely adopted handwriting programs in the U.S. The LWT handwriting curriculum is so popular because, quite simply, it works! The program holds kids’ attention because it’s fun and hands-on. In LWT’s words, the program “celebrates the child”. 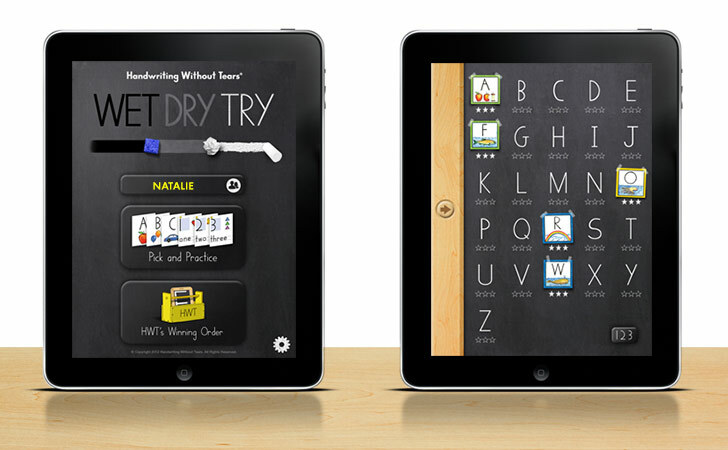 One of LWT’s most popular products for Pre-K and Kindergarten is their Slate Chalkboard, which is used primarily in an activity called “Wet-Dry-Try”. In the Wet-Dry-Try activity, the child has a small piece of chalk (called “little chalk bits”), a small sponge cube, and a small crumpled piece of paper towel. The teacher or therapist draws the model letter (or number) onto the slate and verbally goes through each step with the child. Then it’s the child’s turn. First, the child “wets” the model letter by tracing it with the wet sponge in the correct sequence of strokes. Then, using the crumpled paper towel, the child “dries” the wet letter. The last step is to “try” the letter by drawing it with chalk. The multi-sensory teaching strategy along with repetition builds and reinforces good handwriting habits. The result: children learn to write capitals and numbers with the right steps and without reversals. 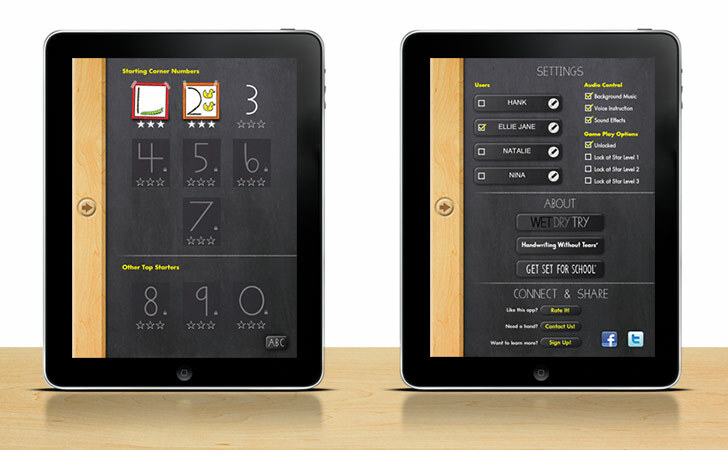 The goal of creating a tablet app for Wet-Dry-Try was to retain the positive learning experience of the real slate chalkboard and make the activity as realistic as possible (without getting wet!). The app simulates the activity by providing voice narrated teacher demonstration and instruction, voice feedback for specific types of errors, and realistic drawing textures and sound effects. The music and voice work in the app was done by two-time Grammy® Award winning recording artists Cathy Fink and Marcy Marxer, who have also performed and produced most of LWT’s kid’s music. From the home screen, the User can select from two games: Pick & Practice, or LWT’s Winning Order. In Pick & Practice, the User can select any letter or number in any order. In LWT’s Winning Order, the User must progress through the letters in LWT’s proven developmental teaching order. In both games, there are three levels of difficulty for each letter. After completing each level, the User wins a star. After achieving three stars, the User wins a Letter Card, which is then displayed on the screen. The goal is to collect all the cards. The Letter Cards feature illustrations drawn by LWT’s founder Jan Olsen. The app is available for sale in iTunes for iPad. Buy it and try it out!